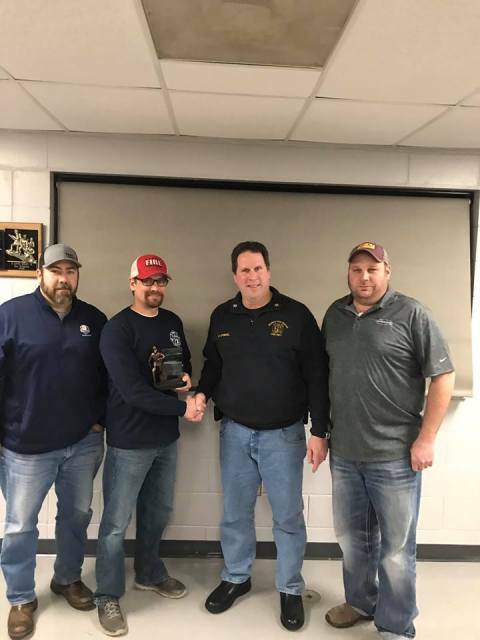 Presenting Darron Carr with the Firefighter of the Year Award are (l to r): 1st Assistant Chief Matt Solemsaas, Darron Carr, Fire Chief Dave Dybdal, and Second Assistant Chief John Lembcke. Morris Fire Department Firefighter Darron Carr was named the 2018 firefighter of the Year, during the department’s annual operations meeting on Monday at the Morris Fire Station. Darron Carr is also the Fire Department’s Fire Prevention Coordinator. Carr has been a member of the fire department for 3 years.